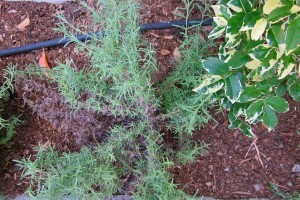 Now that I think I’ve identified what’s going on with one of my Lavender plants, I’ve been trying to research it online. And I’m not finding much. Doing a search for “Mildew on Lavender” doesn’t bring many results that I can learn from so I think I might have the terminology wrong? But here is what I have learnt so far: Powdery Mildew is a fungal disease that can affect indoor and outdoor plants. Plants’ leaves turn white when they’re affected. A few initial white droplets take over the leaf until the entire leaf has a white haze. The disease looks like the leaves have gotten dusty or dirty, according to the Purdue University Extension. Outdoor plants can get powdery mildew at any time of year. Factors that bring on the disease include poor air circulation, temperatures below 70 degrees Fahrenheit and low light. Out of my row of 12 Lavender plants, the affected one sits close to a retaining wall, closest to the trees, and is probably getting shade earlier than most of the others (although there are two that get as much if not more “shade-time”). Then I think I thought I was doing a really good thing by watering them late one evening on a particularly hot day. It was obviously fine for the others but this one … well, I may have caused it. So now how do I fix it? Again, information is not that easy to find online. But this from ehow.com: Move plants to a warmer area with better air circulation and avoid getting water on the leaves to control this disease naturally (that’s what I did wrong!). For chemical treatment, Cornell University suggests spraying with neem oil or fungicide containing potassium bicarbonate. Where do I find “neem oil” or a “fungicide containing potassium bicarbonate”? I’ll let you know if and when I find out! This is interesting: In Germany organic gardeners use stinging nettle to get rid of Mildew. Simply collect this wild growing weed in a big plastic bag, crush the leaves and add some water. Than let it stay in the sun for about a week. Strain the solution and dilute it with water to spray on your roses. This solution is also a great fertilizer. Now where can I get some stinging nettle? So do I just go into a Nursery and ask for “NEUDORFF’S COPPER SOAP” by Biogrow? (Sorry for the complete Rookie question – the researching what to get / use had me totally flummoxed). 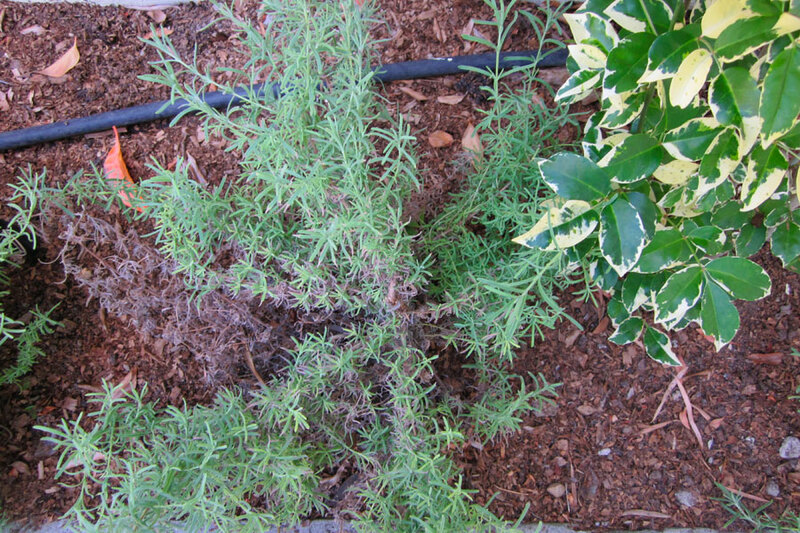 I know how this can affect lavender – my french lavender wilted away from the very same problem and I didn’t know what to do about it at the time. I should have tried using this product – from BIOGROW (natural organic solutions) – maybe it is what you need. But it only seems to work as a preventative measure – so it is not a cure all. This product is a patented, fixed copper fungicide, made by combining a soluble copper fertilizer with a naturally occurring fatty acid. The copper and the fatty acid combine to form a copper salt of the fatty acid, known technically as soap. The copper soap fungicide controls many common diseases using low concentrations of copper, down as low as 90 ppm. The net result is an excellent vegetable, fruit and ornamental fungicide. It decomposes to form soluble copper, and fatty acid, both of which can be used by microbes and plants. The copper soap is suited for use in domestic circumstances, both indoors and outdoors. This product controls diseases of a wide range of plants, including many vegetable, fruit and ornamentals. As with most fungicides it acts to protect plants from infection. Therefore, it is important to have the copper soap on the leaf, flower or fruit before the pathogen is able to cause an infection. This product will control fungal diseases such as : powdery mildew and downy mildew on vegetables and ornamentals, rust on ornamentals, late blight on potatoes and tomatoes, and Peronospora and downy mildew on grapes.